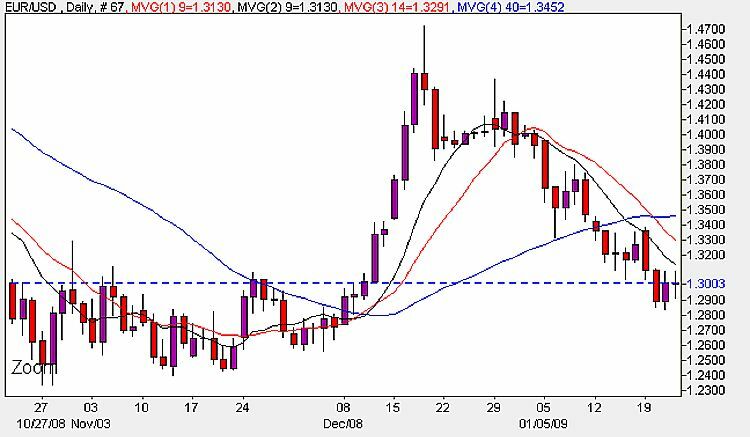 The euro vs dollar pair failed to break above 1.3070 yesterday and as suggested small long trades were the order of the day, but prices failed to hold at this level and ultimately closed very close to the opening prices. Ultimately the pair finished with a doji candle, indicating indecision in the market and a possible turning point from the small rally of the previous day – an in all a very disappointing day for Euro trades. Expect more of the same this morning with a possible move lower, particularly if support at 1.2880 is penetrated. If so, then the euro vs dollar currency pair could fall to the next major support level at 1.2455 in the coming days. The 9 and 14 day moving averages have crossed and the 40 day average is turning lower. For sell positions, your stops will need to be wide as we are in a very congested trading area at the moment, and should certainly be above the previous high of the last three days, at around 1.3100. Please remember when placing your stop loss, not to use a 0, or 5 as the last digit, as these are where most traders will cluster, and they provide an easy target. There is very little siginficant news out today to affect the euro to dollar price, with the siginficant data coming from the UK in the form of initial GDP figures and retail sales.Finally in trading yesterday, the euro dollar pair was correlating positively with the EUR/GBP at +89, and negatively ( or inversely) with the USD/CHF at -92 and -77 with the GBP/CHF, so little changed from yesterday.